Evan Woods, a former member of and current volunteer for the Crossmen, sent this photo. What better place for some Crossmen to visit in New York City than Birdland? We had a "free block" on July 1, and a group of us stopped by to visit one of the jazz landmarks that has been a part of Crossmen shows over the years. It was exciting just to be in this club, look around, and check out the souvenirs. Of course, the famous "Birdland" tune was stuck in our heads for the rest of the day, just like so many fans who have heard the Crossmen play it during the nights of a drum corps summer. 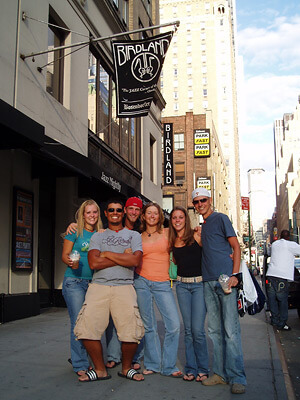 Left to right: Whitney Knolls, Mark Figueroa, Anthony Burnham, Kristen "KK" Richard, Nicole Walsh, Josh Behnke.